Today it is possible to enjoy good quality stereo sound in most homes. It is thus reasonable that the moviegoer should be able to hear the same high quality of sound in the theatre, adding realism, immediacy and impact to the superb high definition picture on the screen. 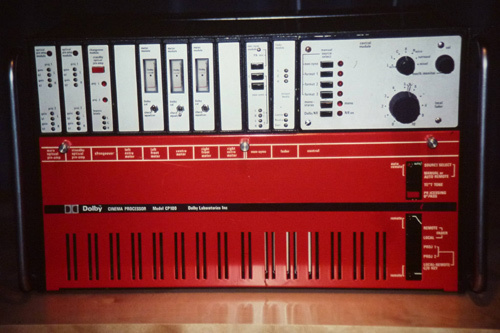 During the last eighteen months, tests carried out by Dolby Laboratories on monaural optical sound-tracks have led to the development of new techniques which for the first time make possible optical sound-tracks in stereo high fidelity. These tracks are made with conventional black-and-white sound processing techniques, utilizing two tracks side by side on the film, in the same location as a conventional monaural track. To play back this track in stereo high fidelity requires Dolby noise reduction decoding of the two signal elements, circuitry to derive centre-channel information for three-loudspeaker systems, and third-octave equalization for accurate matching of the loudspeaker characteristics to the existing theatre acoustics. 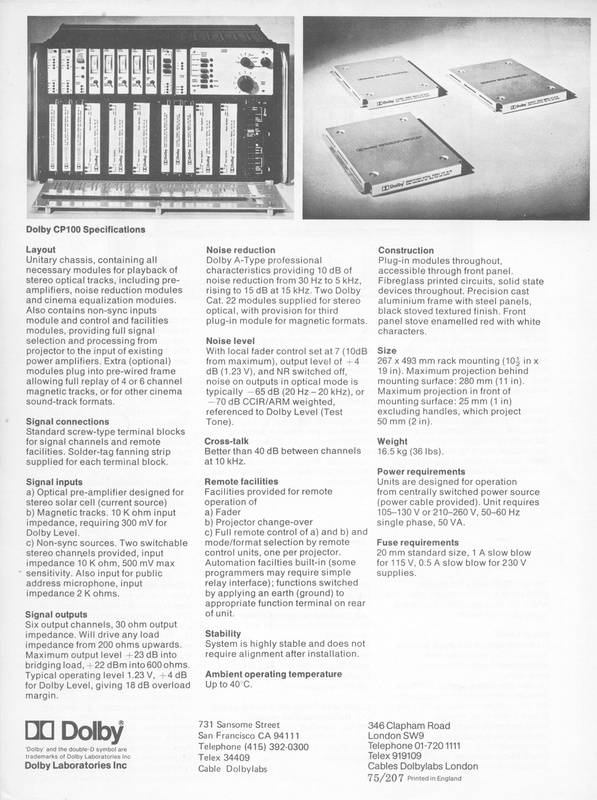 These facilities form the basis of the new Dolby CP100 Cinema Processor. In addition to stereo optical playback capability, the CP100 also employs its equalization circuitry when other film formats are being played. The unit contains comprehensive provision for the playback of conventional optical tracks and, when required, magnetic stripe. Additionally, the unit contains a non-sync capability, so that tapes and records can be played back in the auditorium in high fidelity while using the existing theatre loudspeaker units. The unit represents a simple one-time cost if the theatre already has three suitable power amplifiers and loudspeakers. 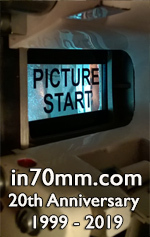 The CP100 Cinema Processor consists of a 19-inch main frame, into which the modules listed below are plugged in two levels. 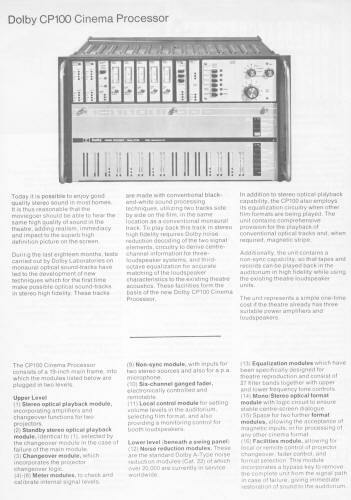 (1) Stereo optical playback module, incorporating amplifiers and changeover functions for two projectors. (2) Standby stereo optical playback module, identical to (1), selected by the changeover module in the case of failure of the main module. (3) Changeover module, which incorporates the projector changeover logic. (4)-(8) Meter modules, to check and calibrate internal signal levels. (9) Non-sync module, with inputs for two stereo sources and also for a p.a. microphone. 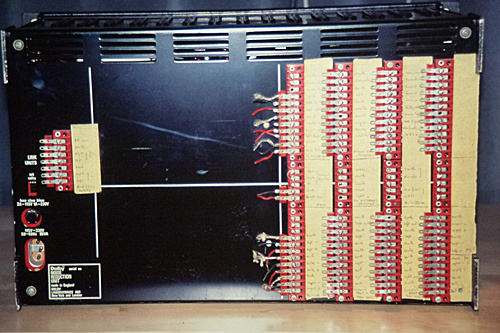 (10) Six-channel ganged fader, electronically controlled and remotable. (11) Local control module for setting volume levels in the auditorium, selecting film format, and also providing a monitoring control for booth loudspeakers. (12) Noise reduction modules. 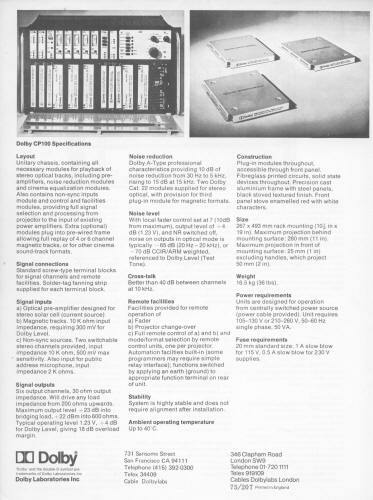 These are the standard Dolby A-Type noise reduction modules (Cat. 22) of which over 20,000 are currently in service worldwide. (13) Equalization modules which have been specifically designed for theatre reproduction and consist of 27 filter bands together with upper and lower frequency tone controls. (14) Mono/Stereo optical format module with logic circuit to ensure stable centre-screen dialogue. (15) Space for two further format modules, allowing the acceptance of magnetic inputs, or for processing of any other cinema format. (16) Facilities module, allowing for local or remote control of projector changeover, fader control, and format selection. 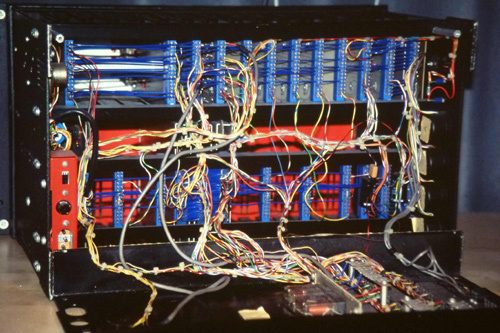 This module incorporates a bypass key to remove the complete unit from the signal path in case of failure, giving immediate restoration of sound to the auditorium. Unitary chassis, containing all necessary modules for playback of stereo optical tracks, including pre-amplifiers, noise reduction modules and cinema equalization modules. Also contains non-sync inputs module and control and facilities modules, providing full signal selection and processing from projector to the input of existing power amplifiers. Extra (optional) modules plug into pre-wired frame allowing full replay of 4 or 6 channel magnetic tracks, or for other cinema sound-track formats. Standard screw-type terminal blocks for signal channels and remote facilities. Solder-tag fanning strip supplied for each terminal block. b) Magnetic tracks. 10 K ohm input impedance, requiring 300 mV for Dolby Level. c) Non-sync sources. Two switchable stereo channels provided, input impedance 10 K ohm, 5OO mV max sensitivity. Also input for public address microphone, input impedance 2 K ohms. Six output channels, 30 ohm output impedance. Will drive any load impedance from 200 ohms upwards. Maximum output level +23 dB into bridging load, +22 dBm into 600 ohms. Typical operating level 1.23 V, +4 dB for Dolby Level, giving 18 dB overload margin. Dolby A-Type professional characteristics providing 10dB of noise reduction from 30 Hz to 5 kHz, rising to 15 dB at 15 kHz. Two Dolby Cat. 22 modules supplied for stereo optical, with provision for third plug-in module for magnetic formats. 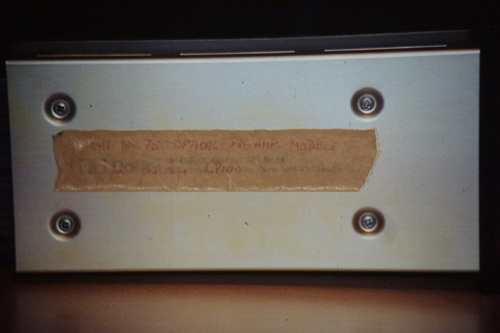 I used to own the very first CP100 used for "Tommy" at the Odeon West End, although not the Quintaphonic decoder. It was only used for "Tommy" then removed. After that, its history seems unclear. I spoke to many people about it and got nowhere. I got it from a dealer of equipment for spares in 1995 and swapped it for a television picture tube and when I got it home, I soon realized it was different and stored it on a display shelf for several years until 2003, when Dolby suddenly asked me if I want to sell it or have equipment. With local fader control set at 7 (10dB from maximum), output level of +4 dB (1.23 V), and NR switched off, noise on outputs in optical mode is typically -65 dB (20 Hz - 20 kHz), or -70 dB CCIR/ARM weighted, referenced to Dolby Level (Test Tone). Better than 40 dB between channels at 10 kHz. c) Full remote control of a) and b) and mode/format selection by remote control units, one per projector. Automation facilties built-in (some programmers may require simple relay interface); functions switched by applying an earth (ground) to appropriate function terminal on rear of unit. I gave it to them in return for a DA20 and cat701 head so I could modify my existing CP100 (something I had always wanted to do). I took the photos on slide film and sent the originals prints to Dolby. These are copies I made off the slides. The 2 photos of the rear show the messy wiring were a CP100 is loomed neatly and the back plate which shows its a noise reduction unit, not a cinema processor and its been relabelled with masking tape. System is highly stable and does not require alignment after installation. Plug-in modules throughout, accessible through front panel. Fibreglass printed circuits, solid state devices throughout. Precision cast aluminium frame with steel panels, black stoved textured finish. Front panel stove enamelled red with white characters. 267 x 493 mm rack mounting (10½ in x 19 in). Maximum projection behind mounting surface: 280 mm (11 in). Maximum projection in front of mounting surface: 25 mm (1 in) excluding handles, which project 50 mm (2 in). The module pictures is the optical pre amp and the label shows for prototype CP100. The front originally came with the outer meter modules missing I fitted blanks as it looked better on display. The CP100 now sits on a glass shelf in Dolby's San Francisco head quarters. There is a picture of it on the Film-tech web site under photos for Dolby Labs Screening Room. One retired Odeon engineer gave me a original brochure which I enclose. Units are designed for operation from centrally switched power source (power cable provided). Unit requires 105-130 V or 210-260 V, 50-60 Hz single phase, 50 VA.
20 mm standard size, 1 A slow blow for 115V, 0.5 A slow blow for 230 V supplies.